I know I’ve posted a zillion pancake recipes. And you’re probably sick of pancakes. But I never get sick of pancakes! They’re one of my favorite parts of the weekend. 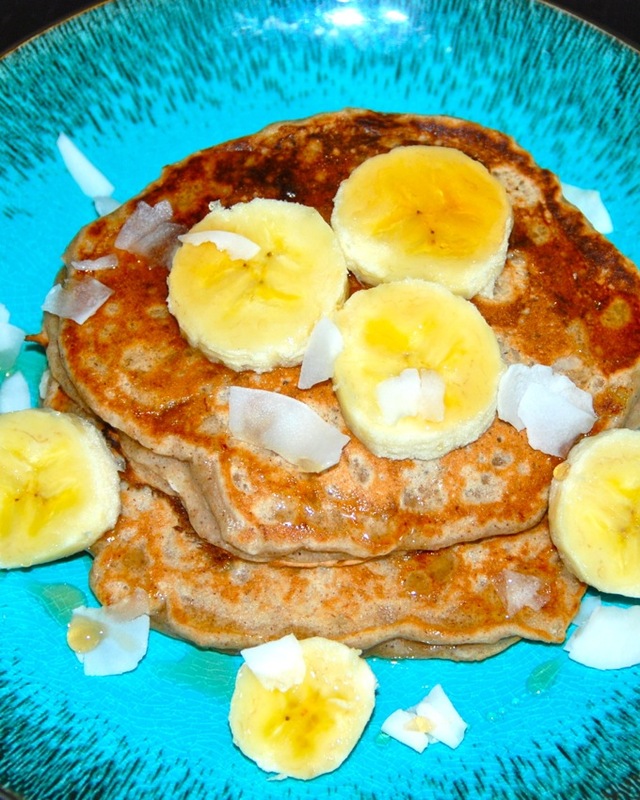 Especially when they involves yummy things like banana and coconut. After making Thai-Style Halibut in Coconut-Curry Broth, I had half a can of coconut milk sitting in my fridge. Since I have to go all the way to the fancy supermarket here to find light coconut milk, I definitely can’t let it go to waste. I’d had my Thai food fix, so my next thought was baking. I contemplated muffins, but pancakes sounded better. And luckily I just happened to have a few bananas a little past their prime. This recipe came from a vegan blog, but I quickly un-veganized it with butter. You could use coconut butter (as did the original recipe) or vegetable oil in place of the butter if you wanted to, but as far as I’m concerned, butter is better! In a mixing bowl, combine flours, baking powder, spices, sugar and salt. In another bowl, combine banana, coconut milk, butter and vanilla. Add wet ingredients to dry, and mix until combine. Fold in coconut flakes. Heat a skillet over medium heat and spray with nonstick spray. 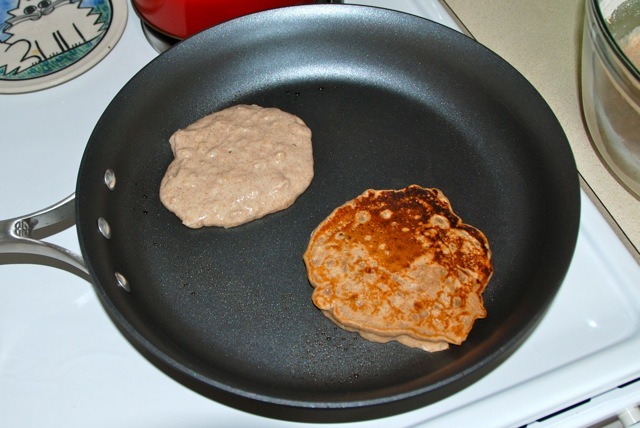 Ladle batter into pan and cook until bubbles begin to form on top of the pancake. Flip and cook and additional two minutes, until bottom is golden brown. 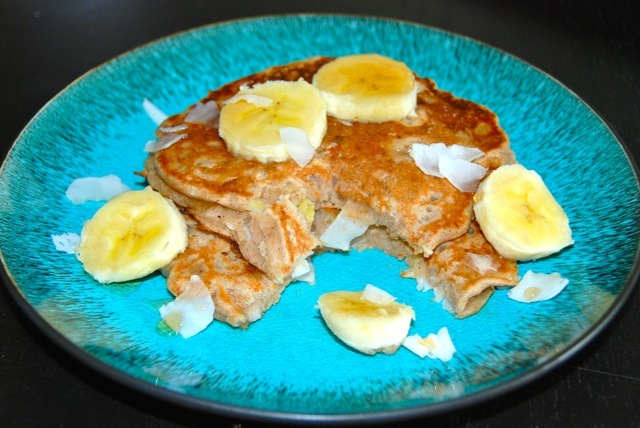 Serve with extra banana slices and maple syrup. I’m not sure if it was the banana or the coconut milk, or a magical combination of both, but MAN were these moist and delicious! You could definitely eat these without syrup and be perfectly happy (though I’m not sure why you would want to). 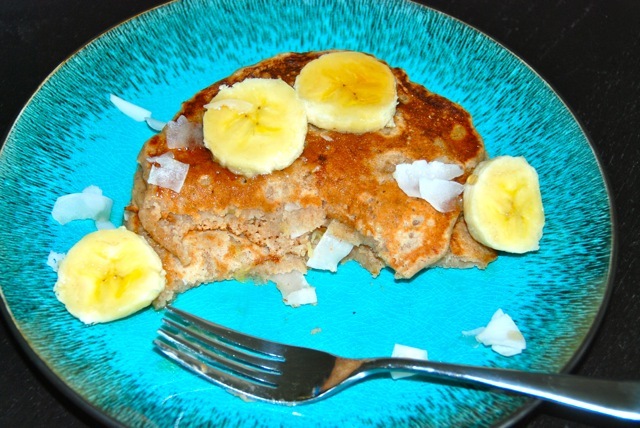 The coconut flavor was subtle, but I loved the texture the flakes gave the pancakes. As usual, I popped the leftovers in the toaster for easy weekday breakfasts. They were still moist even reheated, and quite yummy smothered with peanut butter.